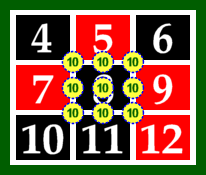 There are 12 basic bets in Roulette: single number (Straight), two numbers (Split), three numbers (Street), four numbers (Square), six numbers (Line bet), dozens, adjacent dozens, columns, adjacent columns, red or black, even or odd, high or low numbers. Except for these basic bets there are several specific bets. 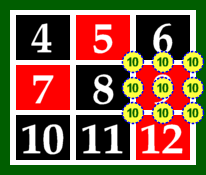 Completing a number can be made by nine chips – see the figures below. The win depends on whether the winning number is situated in the middle or on the edge. The overall payout is 135:1! The Final Bet or Finale (from French) is made on the last digit of a number. For instance Final Four means that you bet on the numbers 4, 14, 24 and 34. The bet on Final 1–6 requires 4 chips, while Final 6–9 gets along with just 3 chips. Sometimes you may feel that a ball has tendency to fall into some pockets of the small wheel of the Roulette more frequently. The wheel of Roulette is manufactured with high precision. However one cannot cut out some microscopic inaccuracies. This circumstance can be utilized by betting on adjacent numbers (or so called Voisins in French). The first of these bets include 12 numbers from 33 to 27. The bet on the zero neighbors include 17 numbers in total from 25 to 22. 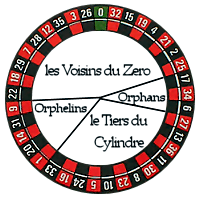 And finally the Orphans represent the rest of the numbers of the French wheel, i.e. 6–17 and 9–1.